There’s hardly anyone who hasn’t grown up reading comics being totally engrossed in it. 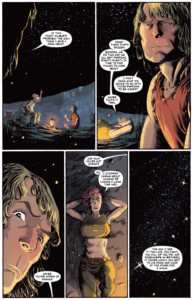 Comics transport us to different worlds of superheroes, enchanted places, magic, horror and fantasy. It acts a temporary escapade from the otherwise monotonous humdrums of reality. Over the years, comics have seen several changes in terms of content and its treatment. Fantasy tales has remained a fan-favourite throughout and low-fantasy, more so. Low fantasy is a subgenre of fantasy fiction where magical events intrude on a normal world. It thus contrasts with high fantasy stories, which take place in a fictional world with its own set of rules and physical laws. 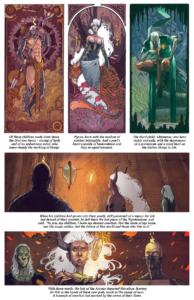 Indian by birth and currently based out of London, comic artist and writer, Ram Venkatesan’s Brigands and its sequel Brigands:Ruin of Thieves, explores the same. Told through four books and with the last issue of the second season going to be out on 5 September, Ruin of Thieves is a grimdark sword and sorcery story with a heist movie plot as our heroes must survive cross and double cross their own reputations to come out on top. “Brigands is pretty much low-fantasy stories I’d love to read as a kid. They’re massive comfort read. Joe Abercombie’s First Law books were very influential. Talking about just the fourth book would give away the climax! Suffice to say in Ruin of Thieves our heroes get into a whole lot of trouble and then, through a combination of luck, grit, lots of stabbing and a moment of magic, they get out of trouble but only to find that all the things they’ve assumed so far, might just be wrong. And what seemed like a victory might only be a brief reprieve from the thunderclouds waiting at the horizon,” mentioned Venkatesan. Ruin of Thieves follows the events after the Myros Comet passes, setting the night ablaze, a spark to a tinderbox of political forces vying for its power. As the first flames of conflict begin to rise, the heroes, led by the infamous Stilian ‘Blackheart’ Desault, find themselves on the smuggler’s isle of Rekik and for all their efforts at keeping their heads low, trouble seems not to leave their side. Brigands, had mostly people from abroad working on the art with colourist Roshan being the only Indian on board. 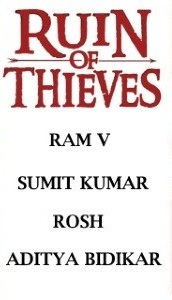 In Ruin of Thieves however, Venkatesan had changed the style of the book by bringing in an all Indian crew with Sumit Kumar on art and Aditya Bidikar on lettering. Roshan continued as the colourist and the story was taken for publishing by Action Labs Danger Zone . Ruin of Thieves juggles between light-hearted and serious moments. Illustrator Kumar said, “The art style is a mix of serious, dark, heavy, inked art with animated expressions and body language at places to go in sync with the story. It’s basically two styles coming together. Blacksad was an inspiration, though there is a slight difference as Blacksad has dark stories set in an animated world while in Ruin of Thieves, we have a light-hearted, animated story set in a dark, real world. I’m also into video games, so games like Witcher and Skyrim were also a huge source of inspiration. In Ruin of Thieves artworks are mostly traditionally hand drawn in ink. Few pages and panels towards the end that were done digitally in total. 95 per cent of it is traditional, according to Kumar. He further added that in drawing there’s one technique when it comes to storytelling – making decisions that trigger subconscious responses. How a character is drawn, how are they dressed, the composition, angles and many more all fall within the domain of those decisions. 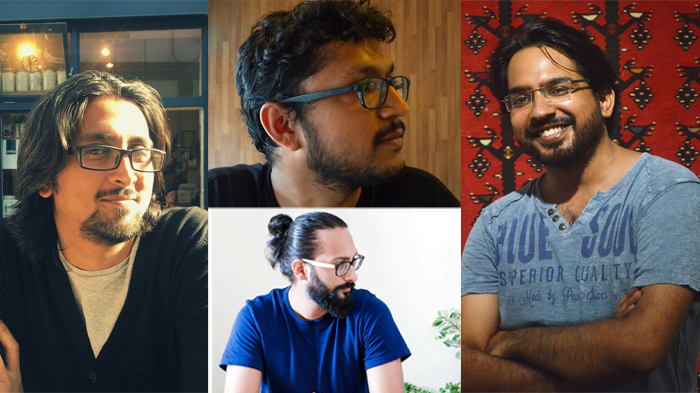 Similarly, colourist Roshan also threw some light on how his techniques influenced the plotline of the book and vice versa. “Even though I love the way water coloured comic books look, I decided to go completely digital with this book. Since Sumit’s inks were so detailed and he had given a bit of texturing in the inking style itself, I thought a colouring style that’s focused much on lighting and some dramatic shadows to perfectly retain the rawness of his inks. I decided to go with a simple technique which involved no photoshop tricks but just filling in every color with a custom made Photoshop brush. Gouache and acrylic paints are some mediums I love working with. Digital colouring makes the process very quick so I mostly stick to that when the deadlines are tight but sometimes I use my own custom made photoshop brushes that gives the feel and texture of a watercolor painting,” he added. Letterer Bidikar too elucidated on his process of lettering that created the impact that the book wanted. Unlike most letterers, Bidikar creates his original font design. “To create a new font design, I usually sketch out a few pages of lettering on paper to try out different styles to see how they work with each other. I usually start with one or two letters and then the rest, trying to fit with those. It takes a lot of trial and error and once I’m happy with the style, I scan the pages and trace the letters out digitally into vector letterforms (usually in Adobe Illustrator),” he noted. Following this process, he polishes the versions that will go into the font besides creating italics and bold versions based on these. Once the letters are finalised, he transfers them into a font creation software (Glyphs in his case) and then work on the spacing between letters and so on. He also creates most of his sound effects by drawing them in Photoshop and then importing them into Illustrator which gives him a lot more control over the design and storytelling than using fonts to create the sounds. Despite the challenge, a project that sounds as exciting as this, has no dearth of enriching experiences for the ones associated with it. The Ruin of Thieves team was no exception. “It was a good experience. Ruin of Thieves have been the kind of story that come to you fully formed. So, it’s only been a matter of putting everything down on paper and allowing for those occasional moments of spontaneity. I work with an excellent creative team so they all make me look very good,” said Venkatesan. Slated to be launched day after tomorrow, Brigands:Ruin of Thieves promises to take one on a thrilling ride with all its add on interesting elements. The single issue will be available in print from 5 September and the team is also working on to make sure that the collected edition is available soon! The digital versions, however are available everywhere. We’re quite sure that we won’t be disappointed!